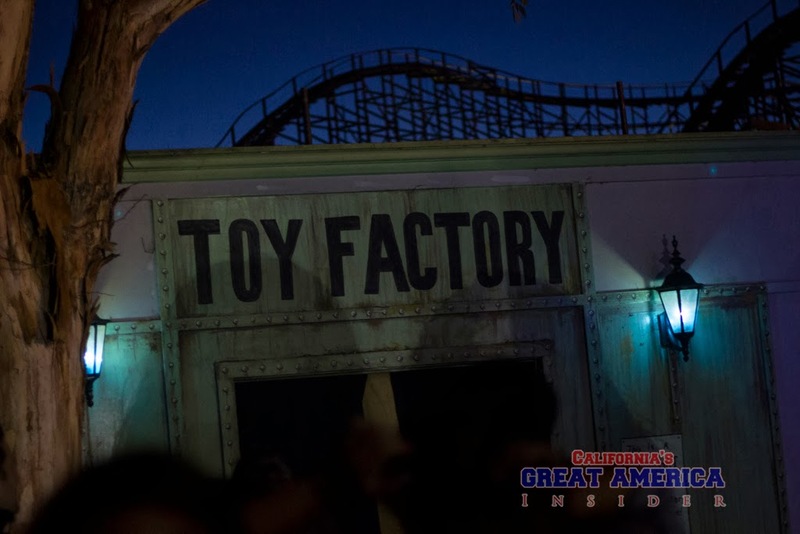 Haunt is in full force at California's Great America, and the last weekend is approaching fast! 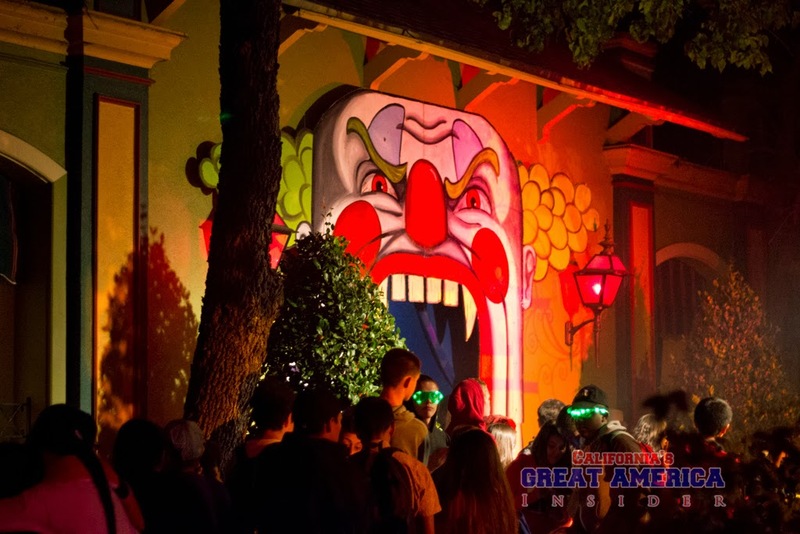 With this said, we decided to share a few tips in maximizing your Haunt visit. Following these few tips will give you satisfying results! California's Great America offers 2 meal options, which works out great if you're out at the park during the day and during Haunt. Since the park closes at 5:30 and reopens for Haunt at 7, there's 1.5 hours to kill. Having dinner at this time is a great idea, and you can save the headache of losing your parking spot and traffic (let alone getting back to the park in time and getting in line to reenter the park). One of the food options, "Fright Feast" is the basic meal option taking place in the Picnic Pavilion near Flight Deck which is pretty much just the meal. New for 2013 is Madame Marie's VooDoo Chophouse, an 'upgraded' take on the former Boofet. There are different food options and more 'upscale' food as opposed to the picnic food at Fright Feast. 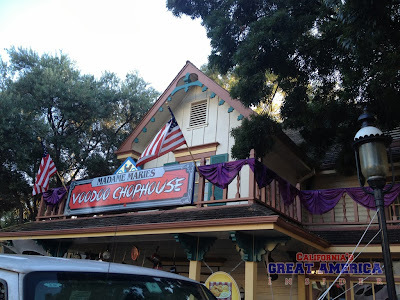 VooDoo Chophouse takes place inside Maggie Brown's Fried Chicken restaurant near Great America Theater. Not only is there better food choices but it also includes a single-use Front of the Line pass good for any one maze. If you're going with a group of friends, it's advisable that everyone goes to this as the passes are only good for 1 guest. It only gets better! From 5:30-7:00 (Haunt opening) the park is giving "exclusive ride time" (or ERT) on Gold Striker. Only those who attended VooDoo Chophouse can get some early rides on it, many in which one doesn't have to even leave the train! So now that you're inside the park, just ate, and did multiple laps on Gold Striker, what maze should you go to first? Naturally, most of the guests are going to run to what is known as the "headliner" mazes, ones that are at the front of the park or really close. Rather than following the crowds as the lines fill up fast, it is advisable to actually head to the back of the park. While everyone is up front, you can literally walk right up to the maze entrance in the back. What we have done was head straight to the new Zombie High maze, followed by doing Toy Factory, and ending the back part of the park with Corn Stalkers. By this time, crowds are working their way back. So at this point, you've already got 3 mazes taken care of. From here, the next closest maze would be Madame Marie's Massacre Manor (as you head up toward the front). We recommend doing this one even if the lines are starting to look a little long. This past weekend, the line moved fairly quick despite how intimidating it looked. Depending on your timing, it may be worth checking out one of the shows! Blood Drums starts at 8:00, and Blades of Horror (A must see!) starts at 8:30. You can actually catch part of Blood Drums near by while you wait for the 8:30 time for the next show. 9:00, much of the initial crowds should be spread out across the park. You have a few choices: Slaughter House, Dia De Los Muertos, and further up the path (in the other direction) CarnEvil. On opening night, Slaughter House had a pretty long and slow-moving line. Assuming you did the Chophouse, it may be wise to use your single use pass on this maze. At this point, it would make sense to finish up with Dia De Los Muertos, CarnEvil and Werewolf Canyon. You can then end your evening at 11:15 with the last showing of CULTure Pop, one of the more hilarious Haunt shows. Also, be sure to visit the scare zones accordingly, based on what maze you're going to. 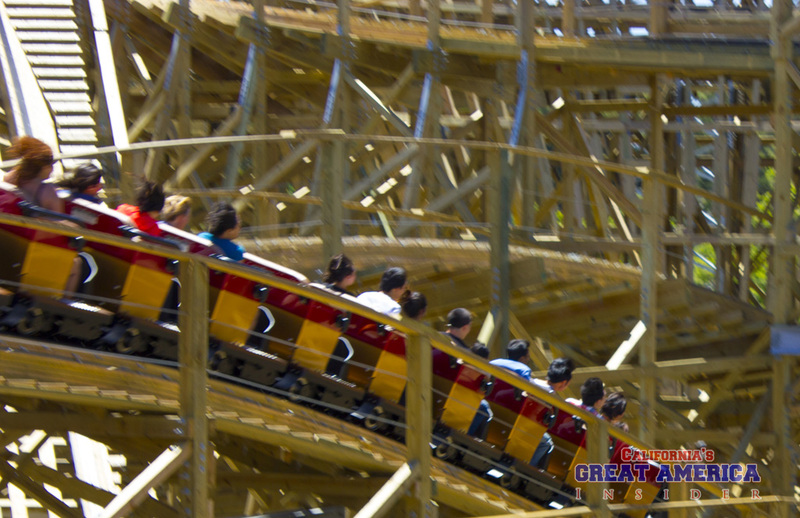 Especially if you're a season pass holder, it's advisable to get your riding done during the day. Daytime crowds are nonexistent and will make riding coasters and such much easier. This makes it easier to focus on the Haunt mazes come night time. We've taken breaks from mazes to do 1 or 2 rides during Haunt but the lines at night can get fairly long! We also recommend checking out the new show Funhouse Express during the daytime hours. Lines were pretty full during Haunt! Following such tips should work out for maximizing your visit for Haunt, and getting the most out of it! 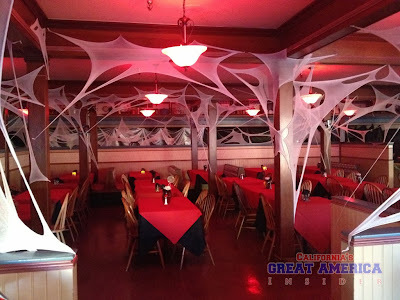 We all hope you have a safe and fun visit at CGA's Haunt! I'm always shocked to see so many strollers etc. at the park during Haunt up here. 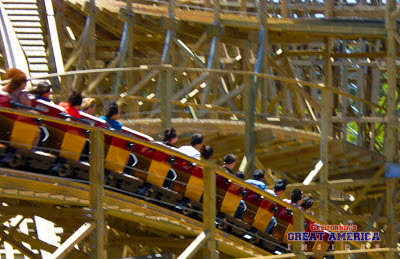 Down at Knott's, you wouldn't see a single one - and that might be to the "established" nature of the event. Then again, these are the same people who complain later in the night that the event was "too scary..."